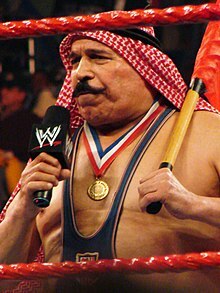 Hossein Khosrow Ali Vaziri (Persie: حسین خسرو علي وزیری‎; (born 15 Mairch 1942) is a Iranian American perfaisional warstler an actor better kent bi his ring name The Iron Sheik. He is kent for endin the near sax-year World Wrestling Federation Championship reign o Bob Backlund, an for being the man Hulk Hogan defeatit for his first WWF Championship. Cast as a heel in the 1980s, he later gained popularity on Opie and Anthony, Kidd Chris, The Howard Stern Show, an on the internet due tae his shoot interviews an ootbursts on the wrestlin industry an the hatred he expressed for various warstlers. Wikimedia Commons haes media relatit tae Iron Sheik. ↑ "Iron Sheik discusses Chris Benoit (Almost 100% Sober)". YouTube. Retrieved August 2, 2010. ↑ Greenberg, Keith Elliot (August 14, 2013). "After Addiction and Tragedy, The Iron Sheik Gets Back Up off the Mat". bleacherreport.com. Retrieved January 11, 2016. ↑ 5.0 5.1 5.2 5.3 5.4 5.5 "Iron Sheik Profile". Online World Of Wrestling. Retrieved September 20, 2008. This page wis last eeditit on 14 Mairch 2019, at 21:45.